(BOSTON) — The Wyss Institute for Biologically Inspired Engineering at Harvard University today announced the launch of its latest startup company, Ultivue Inc. Ultivue will introduce imaging reagents providing super-resolution capabilities on standard single-molecule microscopes similar to those of expensive specialized instruments. The announcement follows a worldwide licensing agreement between Harvard’s Office of Technology Development (OTD) and Ultivue for the Wyss Institute’s DNA-PAINT and Exchange-PAINT technologies, a highly versatile and inexpensive microscopic imaging platform designed to visualize objects with molecular-scale resolution and unprecedented complexity. “We aim to provide an ultimate view into biology. DNA-PAINT and Exchange-PAINT technology distinguishes molecules at super-high resolution and allows researchers to visualize a large number of species at the same time using low cost reagents, simultaneously overcoming two central limitations in conventional microscopic imaging today,” said Peng Yin, a Core Faculty member at the Wyss Institute and an Associate Professor of Systems Biology at Harvard Medical School. Yin led the DNA-PAINT and Exchange-PAINT effort at the Wyss Institute, and is the scientific founder of Ultivue. “We can now study many processes at a molecular level such as changes in chromosomes or minuscule neuronal structures. We also could determine molecular states of diseases in a more comprehensive fashion and with much greater detail, providing an enabling platform for digital pathology,” said Yin. Digital pathology is a growing computer-based trend in medicine aiming to achieve faster, cheaper and more accurate disease diagnostics. Molecular objects that are closer together than 200 nm cannot be distinguished from each other in standard-resolution fluorescent microscopic images and instead appear as single blurry spots. 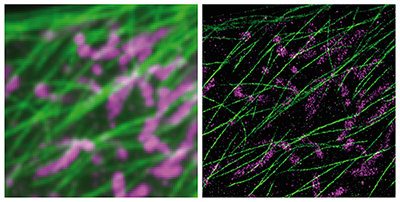 Super-resolution microscopes have been developed to overcome this optical barrier, but their high cost can be prohibitive, and they often rely on specialized conditions and fluorescent dyes that can be turned on and off with the help of a laser. DNA-PAINT on the other hand, can be performed on standard fluorescent microscopes using low-cost DNA-PAINT reagents, and yet surpass the resolving power of current super-resolution microscopes. To accomplish this, DNA-PAINT leverages the physical properties of the genetic material, DNA. The key principle is based on the tunable association of two short complementary DNA strands — one is attached to the object to be visualized and the other to a fluorescent dye. By carefully designing the nucleotide sequence of the complementary DNA strands, the time the two DNA strands remain bound before being separated again can be precisely programmed. This transient DNA interaction typically results in ‘blinking’ of the fluorescent dye with targets being localized by the dye with much higher precision than would be possible by other means. By using different DNA sequences to label distinct targets, and applying the imager strands one target at a time, many distinct targets can be imaged sequentially using only one dye and one laser source. This so-called Exchange-PAINT variation lends itself to multiplexing that can visualize 10 and potentially up to 100 different molecular species. Supported by an NIH Transformative Research Award, an NIH Director’s New Innovator Award, an NIH BRAIN Initiative Award, an NSF Expedition in Computing Award, an NSF Faculty CAREER Award, grants from ONR, and the Wyss Institute’s translational funding, Yin and his co-workers increased the resolution of the initial DNA-PAINT technology and added key capabilities to their platform including multiplexing and compatibility with antibodies, which are broadly used target-specific reagents. The team also engaged with academic partners to successfully test and de-risk a beta version of the future reagent kit on various biological samples. Ultivue will use super-resolution DNA-PAINT and Exchange-PAINT as its defining technologies to develop and expand a portfolio of multiplexed super-resolution-enabling and enhancing products. Beside Yin, Ultivue’s co-founders also include Ralf Jungmann, a former postdoctoral fellow in Yin’s Wyss Institute lab, who co-developed the technologies and now is a Group Leader at the Max Planck Institute of Biochemistry and the Ludwig Maximilian University in Munich, Germany. Additionally, Yin’s former postdoctoral fellows at the Wyss Institute, Xi Chen and Mael Manesse, will be joining the company as Staff Scientists, contributing further expertise to Ultivue’s product development efforts. “The launch of Ultivue is a testament to the Wyss Institute’s ability to launch bioinspired technologies out of the lab and into the commercial marketplace, in this instance by leveraging recent advances in DNA nanotechnology to create a low-cost alternative to super-resolution microscopy that could bring this invaluable new capability into virtually any research or clinical laboratory,” said Wyss Institute Founding Director Don Ingber, M.D., Ph.D., who also is the Judah Folkman Professor of Vascular Biology at Harvard Medical School and Boston Children’s Hospital, and Professor of Bioengineering at SEAS. Harvard University’s Office of Technology Development (http://otd.harvard.edu) is responsible for all activities pertaining to the evaluation, patenting and licensing of new inventions and discoveries made at Harvard University. Harvard OTD also serves to further the development of Harvard technologies through the establishment of sponsored research collaborations with industry. The mission of Harvard OTD is to promote the public good by fostering innovation and translating new inventions made at Harvard into useful products that are available and beneficial to society.